The Toddy: It Cures Your Chills. This tasty classic fall & winter cocktail can soothe us and at times heal us with its warmth and aged Rum complexity. A good toddy should be easy to construct because when you need one, you need it now. 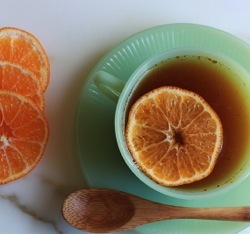 In a large tea cup or mug add the orange whell followed by all of the wet ingredients. Give it a proper stir to dissolve the honey and blend all of the flavors. Serve hot.